U.S. Drug Enforcement Administration (DEA) agents, working with Ecuadorean military and law enforcement organizations, recently discovered a fully operational diesel-electric submarine capable of carrying several tons of cocaine. 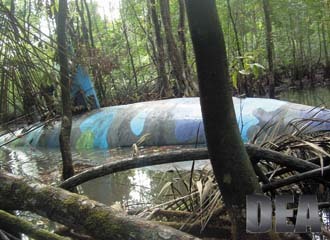 Featuring a periscope-equipped conning tower and air conditioning, the submarine was built in a remote part of the jungle near a river tributary to which it would have been portaged for eventual sea access. The twin-screw craft is 100 feet long and tops out at nine feet in height internally, and it could be used to smuggle terrorists and their weapons as well as narcotics. A broad fight brings more allies into the fray. The transnational threats of drug trafficking, money laundering and narcoterrorism have increased the value of international intelligence to the U.S. Drug Enforcement Administration. The agency is interoperating more closely with U.S. and foreign intelligence agencies to share and process information about threats that only a few years ago were the purview of just one specialty agency. Not all this interoperability comes smoothly, however. The Justice Department agency must adhere to intelligence gathering and dissemination laws strictly. It also must ensure that its use of vital intelligence does not compromise sources or methods. And, its overseas cooperation must follow laws and regulations of at least two countries—the United States and the cooperating nation. Anthony Placido, assistant administrator and chief of intelligence for the Drug Enforcement Administration (DEA), points out that transnational drug activities usually are based in foreign countries where the perpetrators believe they are safe from U.S. law enforcement. To counter these efforts, the DEA must have both a global footprint and effective liaison relationships with law enforcement and intelligence services around the world. The nature of the DEA’s work always has involved intelligence in some form or another, Placido points out. This intelligence may come from the streets of U.S. cities or from overseas sources. The backbone is human source intelligence, which comprises a diverse group of sources and motives. The agency runs a global intelligence network that, at any given time, includes roughly 5,000 registered informants and another 10,000 subsources, he says. The DEA’s involvement in the U.S. intelligence community has not been constant. From 1978 to 1981, it formally belonged to the intelligence community. However, in late 1981, Executive Order 12333 restructured the intelligence community with the DEA being left out of the new construct. After the terrorist attacks of September 11, 2001, the agency returned to the fold to face transnational threats that can overlap with those of other agencies. Placido emphasizes that the DEA’s mission and focus did not change; the nature of the threat changed. “The same shadow facilitators—the people who are document forgers, money launderers and transporters—are overlapping in the terrorism and narcotics world,” he says. Returning to the intelligence fold has allowed the DEA to make better use of community assets and tools in its investigations, Placido says. The agency can obtain products such as situational awareness, imagery and output from other national technical means that can be used as tips and leads to point the DEA in the right direction. The agency then can operate along its own lines of methodology to reconstruct that information in a manner that can be introduced into court. Many of the agency’s transnational threats involve hybrid organizations that are “one part transnational criminal organization and one part terrorist,” he states. Among these are the Revolutionary Armed Forces of Colombia, or FARC; Lebanon-based Hezbollah, which has a presence in the Western Hemisphere; Algeria’s al-Qaida in the Islamic Maghreb, or AQIM; Peru’s Shining Path; and the Kurdish rebel group PKK. Being a component in the post-9/11 U.S. intelligence community offered a new set of challenges for the DEA. As part of the post-9/11 intelligence restructuring, officials emplaced measures designed to serve as firewalls between domestic intelligence and its overseas equivalent. These measures were viewed as necessary to ensure that U.S. laws regarding information collection activities within the country’s borders were not violated. So, the DEA faced the possibility of being hampered by restrictions placed on the intelligence community that legally did not apply to law enforcement. The result was that in 2006 the DEA created its own hybrid organization that includes a sliver of the agency’s intelligence program. Funded under Title 50 of the U.S. Code—which covers war and national defense—and through the National Intelligence Program, this Office of National Security Intelligence serves as the facilitator for the DEA to issue requests to the intelligence community. It also allows the DEA to push information to the community while preserving the primacy of the law enforcement mission for the full DEA. The office includes representatives from intelligence community agencies, U.S. military commands and U.S. law enforcement agencies. It examines intelligence from traffic or communications along with information from a new law enforcement data repository. Experts identify linkages between operations and data from the diverse groups represented in the office, and they can reach out to appropriate organizations for more information. Sources and methods are protected when key information is forwarded to DEA operations. Placido emphasizes that no one who exercises law enforcement authority serves in this office. He describes it as purely an analytic and liaison function within the DEA. Information is gathered and evaluated by this unit, which then pushes it to the community. However, a strict firewall around it prevents any other intelligence organization—even the Office of the Director of National Intelligence—from reaching through the DEA group and exercising law enforcement authorities. This serves to meet many civil liberty concerns and limitations, he adds. Unlike conventional intelligence operations where the goal is to ensure the continuity of the information flow, DEA’s approach is to treat the information as just a means to an end—prosecution and conviction in a U.S. court of law. So, the DEA uses its informants judiciously, and a source’s usefulness may end with its testimony at a trial. Yet technology plays an important role in DEA intelligence gathering. Placido offers that the agency runs more Title III electronic communications intercepts than any other U.S. government law enforcement agency. This amounts to almost 70 percent of the government’s court-authorized communications intercepts. Similarly, the DEA’s foreign counterparts conduct upwards of 50,000 additional intercepts on the agency’s behalf. Nearly $1 million in cash is part of a DEA haul from a series of nationwide drug raids earlier this year. DEA intelligence officers are seeing a greater confluence between drug smuggling and terrorism, as the narcotics trade offers an easy source of badly needed funds for terrorists. Placido says the DEA has mastered the ability to work with these foreign agencies on “judicially authorized” intercepts. These differ from ordinary foreign intelligence intercepts in that they can be introduced as evidence in a U.S. court as long as the information was obtained in line with the foreign country’s laws. This opens the door to greater information exchange between the DEA and a foreign counterpart, and the result often is much greater than the sum of its parts. The DEA also leads the OrganizedCrimeDrugEnforcementFusionCenter, an interagency center that Placido describes as a breakthrough in law enforcement. It features a fused multi-agency database, sophisticated computer systems and advanced analytics to support investigations against transnational criminal organizations. It comprises “the most sensitive investigative information from all of the federal investigative agencies,” he says. As with the Office of National Security Intelligence, the center is restricted in its information sharing. Interagency coordination is necessary to determine how information is used. The tools used in DEA information processing largely focus on consolidation and coordination. Automatic deconfliction tools help make connections between disparate bits of information, such as telephone numbers, e-mail addresses, bank account numbers, physical addresses and license plate numbers. These deconfliction tools have been expanded outside the federal government through the DEA Internet Connectivity Endeavor, or DICE, program. This allows state and local governments to load their own information and deconflict it among themselves and determine if the federal government has the same or similar information. In the field, the agency has deployed a line of license plate readers a few miles north of the southern U.S. border. These readers focus on cash and weapons headed into Mexico, and they are teamed with counterparts at the border that track traffic coming north. Processing power and bandwidth are the two biggest advantages the federal government has over transnational criminal organizations, Placido declares. The ability to process large amounts of information and move it around the world to be shared among investigators keeps law enforcement in the game against its criminal adversaries. The technology challenges that remain are collection and sharing policy issues, he offers. Persistent surveillance and precision geolocation are at the top of the DEA’s technology wish list. “If we could be omnipresent and know of the existence of many of these targets over time and then precision-geolocate them, then all that’s left is getting willing partners that can do something about them in the physical space—which is a relatively easy problem,” Placido warrants. All these efforts are necessary because the threat of narcoterrorism is “very real and growing,” Placido says. He cites a preponderance of evidence and a consensus within the intelligence community that terrorist organizations increasingly are seeking alternative sources of revenue as state sponsorships have dried up. The intelligence community and security services also have drained the well of charitable front organizations. “Many more of these [terrorist] organizations are forced to sing for their own supper,” he relates. The organization that is “most deeply embedded” in narcoterrorism is FARC, Placido states. Describing FARC as a model for where narcoterrorism is going, he points out that FARC began as an ideologically motivated organization with the political goal of overthrowing the government of Colombia. FARC turned to narcotics trafficking to fund its activities, after which the group degenerated from its lofty political agenda to become more of a criminal organization than a revolutionary group. Other terrorist groups have joined the narcoterrorism world. The Taliban in Afghanistan derive a significant amount of funds from the Afghan opium trade, whether actually trafficking or engaging in protection rackets. Placido says that the Taliban are moving along the same lines as FARC, and that may have the same effect of allowing the United States to introduce antidrug tools against the Afghan terrorist organization and break popular support for it. Placido notes that of the 44 organizations designated by the U.S. State Department as terrorist groups, 18 are engaged in at least some aspect of the drug trade. The March 11, 2004, Madrid train bombings that killed nearly 200 people were funded by an al-Qaida splinter group trafficking in methamphetamine and hashish. Concern is growing about linkages between Iran and Venezuela, Bolivia and Nicaragua and terrorist organizations, Placido says. He emphasizes that these countries’ connections may be through their sponsored groups—such as Iran’s Hezbollah—rather than directly from the governments themselves. No smoking gun links any of these governments with narcotics trafficking yet. The Drug Enforcement Administration is applying actionable intelligence to local counterdrug efforts through a special outreach program. In this effort, citizen leaders go to school in a program that educates community leaders in the key issues that affect antidrug operations. This outreach effort differs from that of the intelligence community in that the intelligence program sought to show citizens how they could contribute information that might help forestall a homeland terrorist attack (SIGNAL Magazine, October 2009). The Drug Enforcement Administration (DEA) effort aims at empowering citizens to help recognize and prevent problems in the community before they become law enforcement issues. The outreach program focuses on two elements: the nature of the threat, and DEA’s efforts to combat it. Participants learn details on a global scale and in local terms. And, they are given a better understanding of DEA’s mission and how it carries it out. Ava Cooper-Davis is special agent in charge for DEA’s Washington, D.C., division. This division’s area of responsibility also covers Maryland, Virginia and West Virginia. The Washington division is the fourth in the country to host a Citizen Academy, in which individuals from local community groups, academia, antidrug programs and local business leaders participate in a program that teaches the basic mission area responsibilities of the DEA. A total of 27 people attended the first DEAWashingtonCitizensAcademy this year. Among take-aways from the nine-week program is an education about the dangers of drugs amid communities. For one example, Cooper-Davis cites the pharmaceutical threat—the abuse of prescription drugs, usually by teenagers who raid their parents’ medicine cabinets. She explains that surveys have shown that one in five teenagers has abused drugs in this manner, and two in five actually believe that there is nothing wrong with pirating drugs from home medicine cabinets. In addition to the ever-present possibility of accidental overdoses, these teens also may turn to stronger drugs such as heroin when their home supply runs dry. When CitizensAcademy graduates take that type of knowledge back to their communities, they become force multipliers for DEA, she states. One point emphasized in the academy is the long reach of the drug threat. Cooper-Davis notes that many attendees are surprised to learn the extent of influence waged by foreign drug organizations such as those from Mexico. This provides a clearer picture of the threat than one gleaned from just a local perspective, but it does provide a local flavor to the international scope of the problem. The DEA’s Washington division also supports local law enforcement in counterdrug efforts. Cooper-Davis relates that, at the request of Metropolitan Police Chief Cathy Lanier (SIGNAL Magazine, January 2010, page 17), the DEA created a mobile enforcement team that focuses on local drug-related violence. This team comprises special agents, intelligence analysts and local police task force members. Its focus is to identify and pursue Washington-based organizations that are responsible for drug violence and distribution in local communities. Cooper-Davis reports that this team has been extremely successful at identifying, targeting, disrupting and dismantling these criminal organizations—some of which operated in notorious drug-infested communities. Part of this DEA effort involves continuing outreach to the afflicted communities even after the criminal enterprise has been struck down. Cooper-Davis offers that the Washington division intends to hold its second academy next year. One advantage it has over other divisions is that it can offer its attendees briefings from the highest levels of the agency, law enforcement and the Justice Department. This year’s speakers included Chief Lanier and recently appointed U.S. Attorney Ronald Machen. Building the class required its own outreach effort, and this included tapping diverse groups for representatives. Cooper-Davis relates that, for some participants, she reached out to local chiefs of police for recommendations. The DEA will continue to keep the participants engaged. This will include quarterly meetings and other agency activities, in addition to networking by the attendees. By establishing a continued, long-lasting relationship with these participants, the DEA hopes to keep open access to their communities and provide the seeds of drug prevention. Cooper-Davis offers that only a multifaceted approach can reduce drug abuse. “We can’t arrest our way out of the drug problem,” she points out.